Bromsgrove District Scouts celebrated their Centenary in March, marking 100 years since Scouting first started in the town at the 1st Bromsgrove Scout Group, whose HQ is still located off Charford Road. Since then Scouting has expanded across the District, to include Droitwich, Hagley and all areas in between, and there are now ten Scout Groups in the area. More than 560 young people are involved, a figure which has increased every year since 2004, and the newest Explorer Scout Unit in Hagley now has 16 members with many more keen to join when they reach the age of 14. The Centenary year will see several special events, including “Camp 100”, a weekend of activities for all members of Bromsgrove District from six-year-old Beaver Scouts through to 25-year-old Scout Network members, plus all their leaders and supporters. In order to support these activities, Bromsgrove has more than 100 adults in Scouting, but more are needed – as well as leaders and supporters at Beaver Scout, Cubs Scout and Scout meetings, the organisation is actively seeking a District Treasurer and Secretary to support the District as a whole. For more information about supporting Scouting in and around Bromsgrove, please visit: http://www.bromsgrovescouts.org.uk or call 01527 837060. 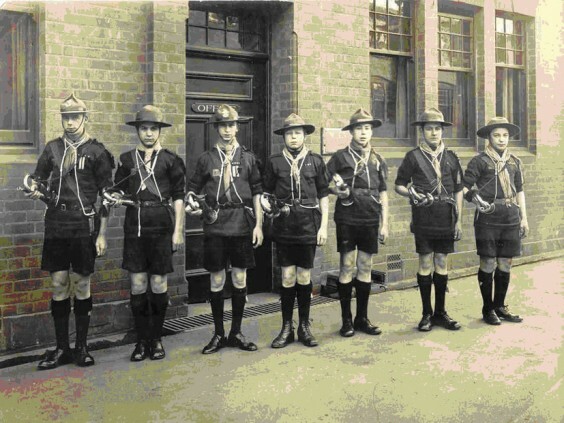 Above: Some of the early Bromsgrove Scouts - Buglers from the 1st Lickey Scout Troop which started in 1911.